Balanced formulation. Aloe content & purity in this product International Aloe Science Council certified. Certified in Mexico as naturally grown. Unique formulation of whole leaf & inner gel. Aloin removed. Rich in polysaccharides. Gently processed. Not reconstituted from powders. 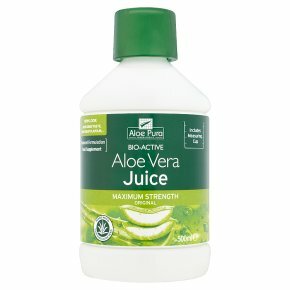 No added sweeteners, flavours or thickeners.The Aloe used in this juice comes from the plant and is not made using powders A unique blend of Aloe Vera whole leaf and unfiltered Aloe Vera inner gel, formulated with the minimum of processing to allow the plant's natural components to remain unaltered and provide high levels of natural activity, as is expected in a quality Aloe Vera Juice - Maximum Strength - As Nature Intended. Directions: Shake well before use. Recommended Daily Intake: As a liquid food supplement, take 25ml daily, direct or mixed with water or fruit juice (can be taken twice daily if required). Do not exceed the recommended daily intake. Food supplements should not be used as a substitute for a varied diet and healthy lifestyle. Note: Aloe Vera, being a natural product, may vary in taste, colour and consistency from batch to batch. This does not affect the quality or potency of the juice. Avoid use whilst pregnant or breast feeding. Not suitable for infants. <br><br>Keep out of reach of children.